OK, so I’m not blogging even close to every day – but I’m still spinning every day, and still gaining the benefits of daily practice. 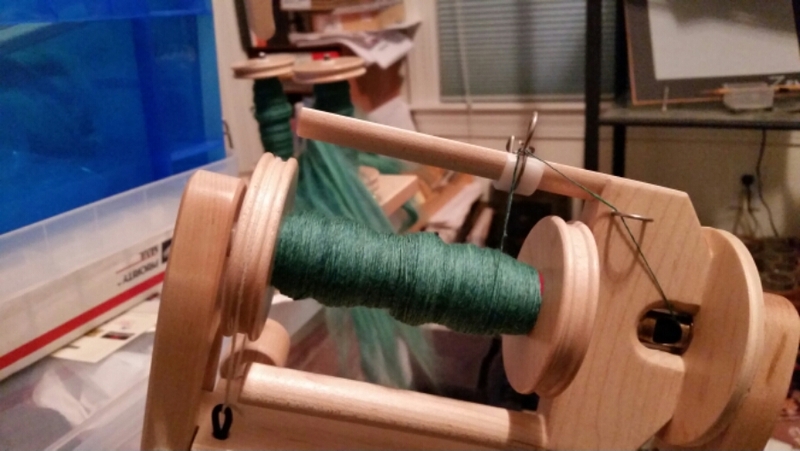 I’m just about done with the second set of singles of the green merino, to be plied as 3-ply. I should finish up the spinning tomorrow night, and then ply Friday night. I’ve decided I’m going to do some Blue-Faced Leicester next – I have both some undyed “practice” BFL and a beautiful dyed braid. I posted that picture last time. I’ll spin & ply a little of the undyed to make sure I have the ratios right, then do some of the braid to see how the colors come out. If I really like it, I’ll order more. I still have my Christmas gift certificate to The Woolery!